Aadhaar Card has become the most important personal document in our life. Aadhaar is an integral part of our identities. It is used almost everywhere like – it is used when you purchase any electronic gadget, mobile phone, sim card, open a bank account, trading account, account in post office, applying for PAN Card, Filing ITR, for Financial Transactions and many more. So it is a very crucial identity tool. As Aadhaar is a very crucial and important document, and it works on the Biometric data of the holder. 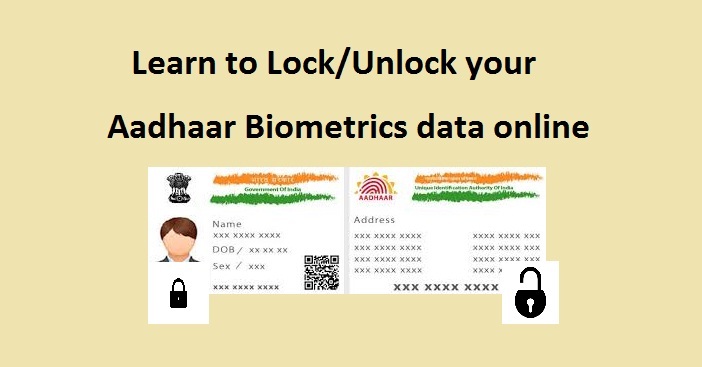 So being an Aadhaar card holder you must know how to Lock and unlock your Aadhaar Biometric data online. So you can be ensured about the security of your personal data. One way to secure your Aadhaar Card is to lock or seal your biometric data. Your fingerprints and iris data are used for authentication of Aadhaar card. There is a biometric locking system which enables the holder to lock and temporarily unlock your biometrics. Once you lock your Aadhaar Biometric data it won’t get unlocked until you want it to be unlocked. Even UIDAI allows Aadhaar card holders to disable and as well as enable your biometric data on UIDAI website. Once you reach to the webpage, enter your 12 digit number; continue following the security code given there in the box. Now click on “Send OTP” link. This OTP will come on the mobile number which is registered with the Aadhaar number. In case OTP does not come, you are required to enter the four digit security code again. Once you get the OTP, enter it. Now click on the ‘Login’ link which appears below to enable the biometric locking. As you click on the given link it will take you to the page that says: “Congratulations! Your biometric data is locked successfully”. Now once the data is locked, you will not be able to authenticate by using your iris or fingerprint. For authentication you have to unlock your biometric data. You can unlock your data temporarily. You can also disable the locking of your biometric data, and keep it free to use. To unlock your Aadhaar biometrics, the process is almost same as locking biometrics. That means you have to go to the same link – ‘https://resident.uidai.gov.in/biometric-lock’ and need to follow the same steps discussed above. So it is advisable that you follow the discussed process of locking the data and make your data safe, so that it cannot be even used against your wish.